Background and objectives: Studies suggest an association between elevated serum alkaline phosphatase (AP) and increased mortality in hemodialysis patients, but the effect of existing therapies on AP is not fully understood. We assessed the effects of cinacalcet on AP in a secondary analysis of controlled trial data. Design, setting, participants, & measurements: This was a post hoc analysis of data from three 26-wk randomized, double-blind, placebo-controlled, phase 3 trials and a 26-wk double-blind, placebo-controlled extension trial that investigated cinacalcet in secondary hyperparathyroidism treatment in dialysis patients. Hemodialysis patients (n = 890) with intact parathyroid hormone ≥300 pg/ml and serum calcium ≥8.4 mg/dl received cinacalcet plus standard therapy or standard therapy alone for up to 52 wk. Total, not bone-specific, AP was assessed (proportion of cinacalcet/control subjects achieving a ≥20% or any AP reduction from baseline; the proportion of subjects with AP ≥120 U/L) at baseline; the end of titration; and study weeks 26, 42, and 52. Results: At 52 wk, a greater proportion of cinacalcet-treated patients had either a ≥20% (39 versus 18%) or any (58 versus 36%) AP reduction compared with control subjects, respectively. The likelihood of achieving either a ≥20% or any AP reduction (determined by relative proportion) was 2.33 (95% confidence interval 1.50 to 3.61) and 1.74 (95% confidence interval 1.31 to 2.31), respectively, at week 52. 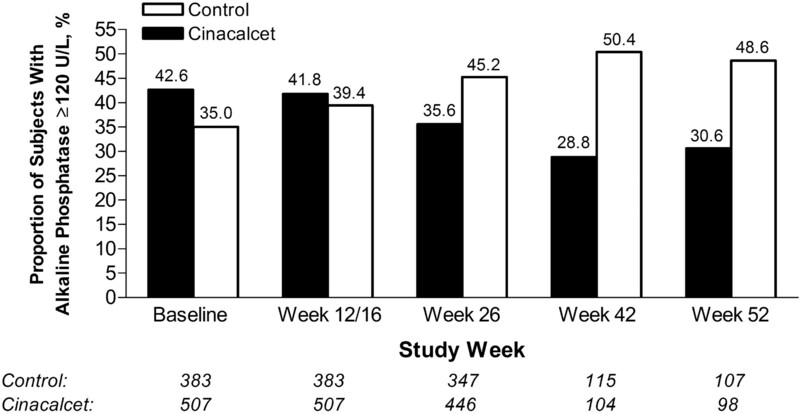 Cinacalcet treatment tended toward a decreased percentage of patients with AP ≥120 U/L (baseline, 42.6%; week 52, 30.6%) compared with control (35.0 to 48.6%, respectively). Conclusions: In this combined analysis of controlled trials of patients who were receiving hemodialysis, cinacalcet lowered total serum AP. Biochemical and pathologic abnormalities are a common component of chronic kidney disease–mineral bone disorder (CKD-MBD) and often include a combination of elevated parathyroid hormone (PTH), parathyroid hyperplasia, and manifestations of disordered calcium and phosphorus homeostasis (1,2). Among the most serious CKD-MBD morbidities are vascular and soft-tissue calcification (3–5) and renal osteodystrophy (6), which often result in increases in markers of bone metabolism, including serum alkaline phosphatase (AP) (7). The association between disordered serum PTH, calcium, phosphorus, and calcium-phosphorus product (Ca × P) and an increased risk for mortality in hemodialysis patients has been described by large observational trials (8–10). More recent observational data have demonstrated a positive monotonic relationship between serum AP levels and mortality (10–12). The calcimimetic cinacalcet HCl reduces serum PTH, calcium, phosphorus, and Ca × P in dialysis patients (13–15), and in a post hoc analysis, treatment was associated with improved clinical outcomes, including improved quality of life and reduced risk for parathyroidectomy, cardiovascular hospitalization, and fracture (16). Furthermore, in a recent small, single-arm study, treatment with cinacalcet was associated with progressive improvement in markers of bone metabolism, including bone AP (17). The aim of these analyses was to assess the effects of cinacalcet on AP in combined studies that investigated the safety and efficacy of cinacalcet in patients who were receiving dialysis. This study was a post hoc analysis of combined data from three 26-wk randomized, double-blind, placebo-controlled, multicenter phase 3 trials (13,14) and a 26-wk double-blind, placebo-controlled extension trial (15), conducted in the United States, Europe, and Australia. These studies investigated the efficacy and safety of cinacalcet in the treatment of secondary hyperparathyroidism (SHPT) in patients who were receiving dialysis. The three parent trials enrolled 1136 patients, respectively, with 266 patients from the former two of the three parent studies continuing treatment in the 26-wk extension study. The studies were conducted in accordance with the principles of the Declaration of Helsinki, study procedures were approved by the appropriate institutional review board or independent ethics committee at each site, and all patients provided written informed consent. Key inclusion and exclusion criteria and study procedures have been reported in detail previously (13–15). In brief, patients who were receiving dialysis for a minimum of 1 to 3 mo (depending on the trial) and had PTH ≥300 pg/ml and serum calcium ≥8.4 mg/dl (to convert serum calcium in mg/dl to mmol/L, multiply by 0.2495) were randomly assigned in a 1:1 or 3:1 cinacalcet:placebo ratio (depending on the trial design) to receive either cinacalcet or a matched placebo in combination with standard (control) therapy. Study blind was maintained through the use of an interactive voice response system and numbered study bottles. The trials consisted of a 12- to 16-wk titration phase followed by a 10- to 14-wk efficacy assessment phase. In the extension study, patients from two of the parent trials could continue to receive treatment in a blinded manner for an additional 6 mo. Cinacalcet was initiated at 30 mg/d and increased sequentially (60, 90, 120, and 180 mg/d) when serum intact PTH (iPTH) was >200 pg/ml unless serum calcium was <7.8 mg/dl, symptoms of hypocalcemia occurred, or an adverse event that precluded a dosage increase occurred. In general, the dosage of vitamin D sterols could be increased if iPTH increased by >50% from baseline, if serum calcium was <8.4 mg/dl, or if symptoms of hypocalcemia developed. The dosage of vitamin D sterols could be decreased if iPTH was <100 pg/ml, serum calcium was ≥11.0 mg/dl, serum phosphorus was ≥6.5 mg/dl (to convert serum phosphorus in mg/dl to mmol/L, multiply by 0.3229), or Ca × P was ≥70 mg2/dl2 (to convert Ca × P in mg2/dl2 to mmol/L, multiply by 0.0806). No restrictions were placed on the dosage or type of phosphate binder used. Serum AP was evaluated at baseline, at the end of the titration phase (week 12 or 16), and week 26 of the parent trials and at weeks 42 and 52 in the extension trial. This study examined four related biochemical outcomes in both treatment groups. The first was the proportion of patients who achieved a reduction in serum AP from baseline by any amount or by at least 20% at weeks 12/16, 26, 42, and 52. The second examined the likelihood (determined using relative proportion) of exhibiting a reduction by any amount or by at least 20% in serum AP. The third examined the proportion of patients with serum AP ≥120 U/L. The fourth assessed whether a correlation exists between serum iPTH and AP levels at weeks 12/16, 26, 42, and 52. Vitamin D sterol and phosphate binder use across assessment points was determined by calculating the proportion of patients who used vitamin D sterols or phosphate binders during each week of AP assessment. For patients with a nonzero dosage, vitamin D sterol dosages were expressed as weekly paricalcitol equivalent dosages (μg/wk). Calcitriol dosages were converted to paricalcitol equivalents by multiplying by a factor of 4. Phosphate binder dosages were expressed as a sum of all phosphate binders expressed as grams per meal. We included data from hemodialysis patients who completed the dosage-titration phase of the studies and who had assessable serum AP measurements at baseline and at the end of the titration phase. We used a log-binomial regression model to estimate, for each week's measurement, the relative proportion of having serum AP reduced by at least 20% and by any amount in the two treatment groups, controlling for age, gender, race, body mass index, time on dialysis (vintage), baseline AP, history of diabetes, and history of cardiovascular disease (including cerebrovascular accident, peripheral vascular disease, myocardial infarction, coronary artery disease, or congestive heart failure) and stroke. To ensure consistency of the results in cases in which the log-binomial model did not converge, we used a model with a reduced number of the covariates. Correlation between serum iPTH and AP at each time point was assessed by Spearman and Pearson correlation analyses. All statistical analyses were conduced using SAS 9.1.3 software (SAS Institute, Cary, NC). Of the 1136 patients enrolled in the parent trials, 890 met the criteria for inclusion in this analysis. Overall, the demographic and clinical characteristics of the cinacalcet and control groups were similar. The median AP level seemed to be slightly higher in the cinacalcet compared with the control group, although the interquartile range (IQR) was similar (Table 1); however, median baseline PTH in the cinacalcet group was somewhat higher than in the control group (601 versus 548 pg/ml), and there was a greater proportion of black patients in the cinacalcet group (52 versus 42%). Mean age was slightly greater in the control than in the cinacalcet group (55 versus 52 yr). The median cinacalcet dosage during the titration phase was 60 mg/d. Serum AP levels tended to increase during the course of the study in the control group, whereas they tended to decrease in the cinacalcet group (Figure 1A). Median serum AP in the control group increased from 99 U/L (IQR 77 to 143) at baseline to 113 U/L (IQR 86 to 189) at week 52. In the cinacalcet group, the median value decreased from 111 U/L (IQR 81 to 153) at baseline to 95 U/L (IQR 74 to 129) at week 52. (A and B) Median (interquartile range [IQR]) serum alkaline phosphatase (AP; A) and median (IQR) serum intact parathyroid hormone (iPTH; B) at baseline and 12/16, 26, 42, and 52 wk in the cinacalcet and control groups. Serum AP was reduced by ≥20% from baseline in a greater proportion of patients in the cinacalcet group than in the control group at all time points (Table 2). The increased adjusted likelihood (determined by relative proportion [RP]) of achieving a ≥20% reduction from baseline in serum AP with cinacalcet was between 1.73 and 2.61 times more likely compared with control subjects across the study time points (week 12/16 RP 1.92 [95% confidence interval (CI) 1.35 to 2.75]; week 26 RP 1.73 [95% CI 1.32 to 2.26]; week 42 RP 2.61 [95% CI 1.64 to 4.14]; and week 52 RP 2.33 [95% CI 1.50 to 3.61]). Similarly, a greater proportion of cinacalcet-treated patients achieved any reduction in serum AP from baseline at all time points. The adjusted likelihood of exhibiting any reduction in serum AP among cinacalcet-treated patients was between 1.09- and 1.44-fold greater when compared with control subjects (week 12/16 RP 1.09 [95% CI 0.94 to 1.27]; week 26 RP 1.44 [95% CI 1.24 to 1.68]; week 42 RP 1.63 [95% CI 1.27 to 2.08]; and week 52 RP 1.74 [95% CI 1.31 o 2.31]). In line with these data, the percentage of patients with an AP level ≥120 U/L increased over time in the control group and decreased over time in the cinacalcet group (Figure 2). Proportion of control subjects and cinacalcet-treated patients with serum AP ≥120 U/L at study weeks 12/16, 26, 42, and 52. Median serum iPTH levels increased over time in the control group and decreased over time in the cinacalcet group (Figure 1B). In the cinacalcet group, the median serum iPTH decreased from 601 U/L (IQR 431 to 871) at baseline to 219 U/L (IQR 123 to 390) at week 52. Median serum iPTH in the control group increased from 548 U/L (IQR 408 to 758) at baseline to 645 U/L (IQR 385 to 920) at week 52. There was a significant (P < 0.0001) correlation between the change from baseline serum AP and the change from baseline iPTH from weeks 12/16 to 52 (Table 3). The strength of this observed correlation tended to increase over time. The use of vitamin D sterols and phosphate binders was largely consistent across assessment points, although there was a slightly higher phosphate binder dosage in the cinacalcet group at week 26 (P = 0.004; Table 4). In this post hoc analysis of pooled data from phase 3 randomized, double-blind, placebo-controlled clinical trials, after adjustment for baseline characteristics, including baseline AP, serum AP was reduced in a greater proportion of patients who were receiving cinacalcet compared with patients who received traditional care alone when examined overall and in the subgroup of patients who achieved a ≥20% reduction. Moreover, the proportion of patients with AP ≥120 U/L decreased during the course of the study in cinacalcet-treated patients but increased in control subjects. In the initial report of the results of two of the studies included in this analysis, cinacalcet significantly reduced serum levels of bone-specific AP at week 26 (13). This study offers several novel and important contributions. First, this study is based on data from multiple trials and includes a greater number of patients. Second, it provides a more comprehensive examination of the relationship between cinacalcet and AP by assessing the time course of the effects of cinacalcet on AP and assessing the strength of the effect through various cut points in AP. Last, this study examines the effect of cinacalcet on serum total AP, rather than bone-specific AP. Importantly, recent studies demonstrated an association between elevated serum AP and mortality in patients who received hemodialysis (10–12). Given these findings, the results of this study are of particular interest. Cinacalcet, like all of the type II calcimimetics, modulates the activity of the calcium-sensing receptor, increasing the sensitivity of parathyroid cells to extracellular calcium and thereby decreasing PTH secretion (18). PTH is a key driver of physiologic and pathophysiologic bone turnover (19) (partially through osteoblastic mechanisms ), and elevated PTH levels are associated with high turnover bone disease (19), increased risk for fracture-related hospitalization (8), and bone loss (evidenced by decreases in bone mineral density) (21). Increased serum bone AP can reflect high-turnover bone disease in patients with CKD (22), and preclinical evidence has linked elevated AP activity and vascular calcification (23,24). Despite evidence associating elevated serum AP with increased mortality (10–12), direct causal connections have not yet been determined. Vitamin D sterols and phosphate binders are traditionally used in the treatment of SHPT (25); therefore, we sought to assess whether their use may have confounded the observed reductions in AP during cinacalcet treatment. Both the frequency of use and dosage of vitamin D sterols and phosphate binders among the control and cinacalcet groups were similar from baseline to week 52, with the exception of a slight increase in phosphate binder dosage among cinacalcet-treated patients at week 26. These results suggest that differences in vitamin D sterol or phosphate binder use are unlikely to have contributed to the observed differences in AP between the cinacalcet and control groups. These findings are not surprising considering that studies analyzed were designed to encourage stable dosages of vitamin D sterols and phosphate binders. For example, Block et al. (13) did not report an appreciable difference in vitamin D sterol use between the cinacalcet and control groups. One potential mechanism by which cinacalcet may have reduced AP is through reductions in serum PTH. In this study, cinacalcet treatment resulted in a rapid decrease in serum PTH levels. There was a moderate but significant correlation between the change from baseline PTH and change from baseline AP; however, despite the correlation between PTH and AP, there remained a substantial degree of variability in AP that could not be explained solely by the involvement of PTH. Moreover, there was a difference in the time course of the response in PTH and AP as evidenced by the increasing strength of the correlation over time. These data suggest that, as a marker, AP may reflect bone dynamics in a slow or dampened manner, whereas PTH responds more quickly. It is also possible that cinacalcet may have directly regulated AP synthesis by osteoblasts, which have been shown to express the calcium-sensing receptor (26,27). SHPT has been associated with increased fractures (28), hospitalizations (8), and increased mortality (8,10), which may, in varying degrees, be linked directly with bone disease; however, it is also possible that the weakened bone associated with renal osteodystrophy may not be the primary cause of the increased mortality associated with AP. Instead, it may act as a surrogate marker for biochemical sequelae of high bone turnover, particularly elevated serum calcium and phosphorus, themselves associated with increased vascular calcification (29), cardiovascular mortality (9), and all-cause mortality (8,9). Moreover, elevated serum phosphorus has been associated with increased cardiovascular hospitalization (8). Preclinical (30) evidence suggests that renal osteodystrophy may contribute to vascular calcification in hemodialysis patients, and elevations in AP have been associated with an increase in the risk for vascular calcification in a study of pooled patients with stages 4 and 5 CKD (5). Further studies to examine these associations are required. Mortality risk in dialysis patients is substantially greater than for those who have CKD and are not receiving dialysis (31), and much interest has focused on the reduction of PTH through the use of cinacalcet or vitamin D sterols as a means to minimize this risk. At present, there are no reports of randomized, prospective clinical trials that have investigated the effects of such therapies on mortality in dialysis patients. As a consequence, treatment decisions have been forced to rely on results from post hoc analyses of prospective studies (cinacalcet) (16) and observational studies (vitamin D sterols) (9,32). Overall, it is clear that additional studies are necessary to confirm any associations between existing therapies for CKD-MBD and patient outcomes. Accordingly, prospective, randomized studies designed to determine definitively the ability of cinacalcet to improve patient bone health, reduce vascular calcification, and confer a survival benefit in dialysis patients are ongoing. The data in these analyses were derived from three large, randomized, double-blind, placebo-controlled studies and an extension study, involving patients from the United States, Europe, and Australia. This provided a data set with random allocation of cinacalcet use across different dialysis populations and helped minimize confounding that is common in observational data. Although the initial data came from randomized, controlled trials, the use of a population subset inherent in this type of secondary analysis may have resulted in an imbalance in baseline characteristics. Accordingly, our analyses used multivariate techniques that allowed for the control of multiple characteristics in case residual confounding was introduced by combining data from several trials. In an effort to avoid the potentially misleading results that could arise from estimating odds ratios in cohort studies (33), we estimated the relative likelihood using a log-binomial model and included, at each time point, only patients who had data at that time point. There are, however, limitations to this analysis. First, although it was advantageous to use data from randomized trials, it should be acknowledged that, as with other controlled trials, the population in our analysis may be different from that in actual clinical practice. Furthermore, by design, the parent and the extension trials had different follow-up times, and only patients from two of the parent trials were eligible for entry into the extension trial upon completion of the parent trial (week 26). Thus, fewer patients were able to be analyzed for time points past week 26. Moreover, although these analyses provided data on the overall effect of cinacalcet on AP with respect to traditional therapies, they did not examine dosage-related effects. In addition, these analyses examined total serum AP and not the bone-specific variety. Evidence suggests that the bone-specific variety is a more sensitive measure of bone turnover (22). Finally, because the estimates at weeks 42 and 52 were based on a smaller population, the data should be interpreted cautiously. Cinacalcet treatment resulted in reductions in serum AP levels in patients who had SHPT and were receiving hemodialysis. Further studies to examine the associations among cinacalcet, AP, and clinical outcomes are needed to determine the clinical significance of these findings. This study and the writing of the manuscript were supported by Amgen, Inc. V.B., W.G.G., and L.R. are employees of and stockholders in Amgen, Inc. K.K.-Z. has received grants and/or honoraria from Amgen, Abbott, Genzyme, and Shire. This work was presented in part at the 40th annual meeting of the American Society of Nephrology; October 31 through November 5, 2007; San Diego, CA. We thank William W. Stark, Jr., PhD (Amgen, Inc.), and Ali Hassan, PhD (Complete Healthcare Communications, Inc., on behalf of Amgen, Inc.), for assistance in the writing of this article.